tions and head the new government. residents could stand for election. Jewish Family & Children's Service. in the territories would get the vote. at a meeting in London in April 1987. "is serious in his desire for peace"
children," Peres told the press group. that bedeviled Israel this past year. tary Trail in West Palm Beach. ing in the 1989 Campaign. event on Tuesday, Nov. 15th. need to at least double the size. work as hard," he added. co-chair for the whole Village. October 5,1988, at Bear Lakes Country Club in West Palm Beach. spoke on "Communicating Campaign Successfully." have come to expect it now." For More Information, contact Edward Baker. here. Our lights are burning. go out. We will not let it. the U.S. from Nov. 13-19,"
sung by children in grades 5-8.
chen staff at Kfar Kana. Monday, November 7,1988, 6 p.m.
work quilt is not new for the 1988 election. and predictable ethnic agenda items. little hackneyed before election day. territories in return for the potential of peace. Again, 64 percent denounce the status quo. would have been endorsed, as well. 10 months of the Intifada, or Arab uprising. the centrality and indivisibility of Jerusalem. With that, there is bare argument. Despite the fact that "PAC"
lobby for Israel in Washington. has voted aid to Israel. who were running at the time. Meeelng.Marvin s. Rosen, Mortimer Weiss. Treaeurer, Helen Q Hoffman Aaaistant Treeeurer, Mart. F Levy Secretary. Leah Slakln; Assistant Secretary. Barbara Qordon-Qnaan. Submit material lo Lor! amendment is backed by U.S.
Florida as its target goal. to provide an alternative to it. and respect which America's Jews hold for Israel. are eager for this business. almost impossible to recall it. ducted in 1983,1984 and 1986.
ognized Israel's right to exist. taken in Israel between Aug.
ready to trade land for peace. all of them without peace. power plants open in Israel. beautiful foliage and a beautiful river experience. Enjoy our Bar-B-Q with some great people. racism in all their forms." three to four years here,"
concept of a JCC, however. Car. Meet new friends over cocktails. Even take in a free movie. The IBS Auto Train leaves each afternoon from just outside Orlando. of taking the train instead. 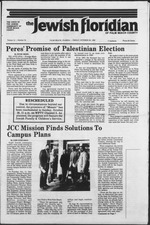 Page 8 The Jewish Floridian of Palm Beach County/Friday, October 28, 1988.
and Israel on this sensitive subject. When it comes to overall U.S.
continue to pose a threat to Jordan? of the Anti-Defamation League ofB'nai B'rith. in its relations with Israel. media and even the CIA. popular in Korea, a "Jewish scheme"
South Korea would have perished. Now that the Olympics are over. establish trade relations with Israel. HI AS to "never let up in our efforts to help people leave." City, is Ben Zion Leuchter, left, president of HI AS. mitted questions to Harry A.
arms sales to Arab countries? out of proportion by the media. ing out a Palestinian state. cisco or to a kibbutz in Israel?" his people out of Egypt." that each student practice it. of the biblical Land of Israel. timore Sun published on Sept.
there was a "ring of truth"
his campaign base in Chicago. news and in the newspapers. So why discuss these issues? So they invent an issue. voters on the Israel issue. scores of musicals and plays. the Water" and "Hello Dolly." WIENER, Morris. 76, of Royal Palm Beach. Plan Chapel. West Palm Beach. their frozen state. Buy some today! In June 1986, the U.S.
larly at the United Nations. said. "Let's leave it at that. at least until election day." want their mayor to speak out. Israel to its pre-1967 borders. comment on his reported trip. Opening Judaic Studies Center NSiESP VhacPnnd? will be heard in Family Court. for Disease Control in Atlanta. receive a single polio booster,"
explained Mize of the CDC. in charge of the pavilion. Bulgaria, it was reported here. and visited in recent years. Palm Beach County. Publication No. 501 S. Flagler Drive, West Palm Beach. Fla.
publishers: 120 N.E. 6 Street. Miami. Fla.
editor: Fred K. Shochet, 120 N.E. 6 Street. Miami, Fla. 33132. 7 Owner, Fred K.
Shochet, 120 N.E. 6 Street. Miami. Fla.
El in West Palm Beach. I lor_____VHS copies of Back On Track. affairs in the Palm Beaches. when the office was very busy. they go to the polls next week. called the face-off a tie. mandate in the next Knesset. worth of "made in Israel"
it was not delivering a baby. might not survive in the wild. 12. Fee: $4 for entire course. gies that are being developed. your right to your feelings. will lead this delightful series. 7 at 10 a.m. at JCC. 4806 or Sabina at 683-0852.
aged. Call Louise at 689-7700.
teret Bank in Century Village. Louise at 689-7700 by Nov. 9.
tre at Boca Raton Mall. tor of Sotheby's Judaica Dept. tour starts at 2, returns at 4. Boca). Cost: JCC members $7, non members $9. provide the munchies. Cost: $2. Military) to enjoy the Happy Hour at this favorite spot. evening of wine, cheese and good conversation. Cost: $3. Camp Shalom (7875 Belvedere Rd., 11/2 mi. past the Tpke. to let us know you re coming. will be led by the talented Karen Blum. the week of Nov. 6-13.
held Sunday, Nov. 6, 9:30 a.m.
17, at the Royce Hotel, W.
vices for the youth of Israel. gation Anshei Sholom on Nov.
be a fashion show by Lisa. Women's Division, Outreach Coffee, 9:30 a.m.
Jewish Community Center, Family Event. Force, Sub-Committee Meeting, 7:30 p.m.
Nov. 1 B'nai B'rith Women Shalom, board, 9:30 a.m.
Yiddish Culture Group Century Village, 10 a.m.
Beach, 12:30 p.m. Temple Beth David, board, 8 p.m.
sah Mt. Scopus Boynton Beach Chapter, 7:30 p.m.
Worth Jewish Center Sisterhood, board, 9:30 a.m.
of Jewish Women Palm Beach, board, 9:30 a.m.
of Jewish Women, Flagler Evening, board, 7:30 p.m.
For information contact the Federation office, 832-2120.
ratified the convention on Feb.
accepted by the United States. requirement of the UN treaty. of the bill to vote against it. voted to confirm 11 judges. isfy a $20 million unpaid debt. Labor is, in fact, vulnerable. and many more were arrested. tified as Ossama Abu-Dehi, 20. Services Friday evening 8 p.m.; Saturday 9 a.m.
rience to his new position. Thursday, Nov. S, 10:80 a.m.
the Jews of the Middle Ages. All classes run for six weeks. review of "A Mother's Secret"
11:30 a.m., on a daily basis. "The Black Box" by Amos Oz. meeting on Nov. 3, 7:30 p.m.
^ Oct. 28 6:24 p.m.
Janis Tepper, membership co-chair at Temple Beth David, Pain. Judy Benvenista, Linda Manko (co-president of the temple) otw'. Joel Hersch. Guests at the Temple's recent open house had ar. international rates brochure 1 MO S74- 4000.